First things first. As usual, the French are on strike. Through June. I cannot recall how many times I have arrived to an embouteillage on the Route Nationale or a train or plane strike. Macron is trying again where others have failed to disable the crippling pensions and work rules of the syndicats (we have the same problem in the US) where minimal number of hours per week and early retirement are the norm. The SNCF have even published a calendar of advance dates when the strike is on and off, and weekly and daily updates. However it’s not totally working. The Eurostar made an unscheduled stop in Lille for precisely 24 minutes announced in advance for a technical problem (how did they know it would take 24 minutes?!) and which we presumed to be a union effort to go into overtime. Nevertheless, as usual, though still a bit chilly and rainy, Paris is the best, the Luxembourg gardens already planted and blooming (hey ouvriers, this planting is where the state money is going), everything green and gorgeous. There is lots to see and do, and here again, in no particular order, a list of suggestions. 1. The Musee d’Orsay (which has my least favorite museum architecture in the world) has a lovely show of Baltic Symbolist art. I had never seen any of these paintings, and they are pretty, mysterious, fanciful. Some look quite contemporary. 2. 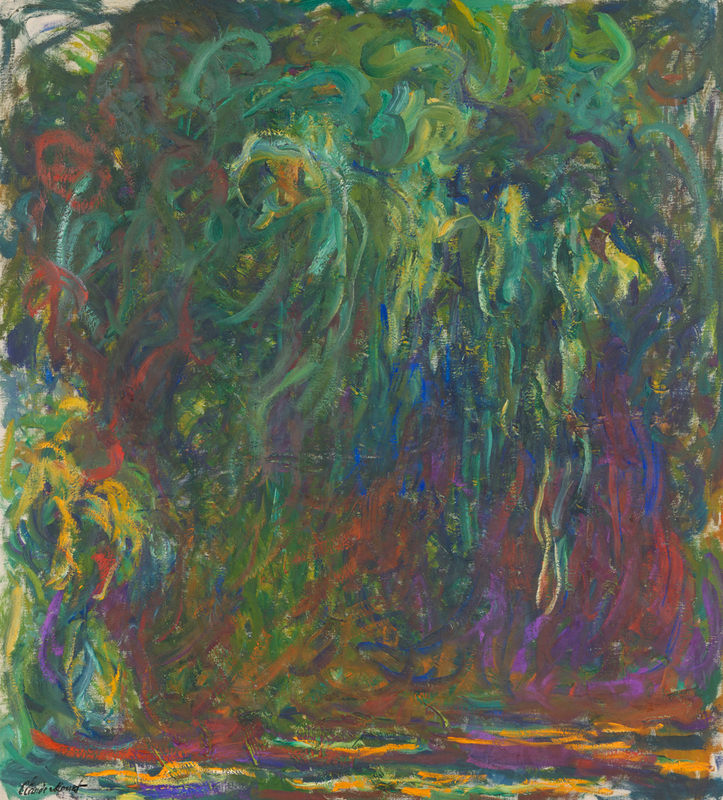 The Orangerie has a revelatory exhibit of selected Monets alongside the New York school of Abstract Expressionists. At first hearing about this I was skeptical as there seems to be a virus of Monet exhibits worldwide. I instead came away feeling these paintings had been ‘separated at birth’. Monet became very abstract and Alfred Barr at MoMA organized a show in 1955, here partially revisited. Clement Greenberg and Helen Frankenthaler, then an item, came to see the Monets together in Paris. Greenberg made an impression himself with his endorsement of Monet’s canvases in a famous essay extolling his late work which produced an ''all-over' sensation'. Joan Mitchell, de Kooning, Kelly, Pollock and more--the parallels are unmistakeable. 3. Ah Delacroix. This historic exhibition at the Louvre, a complete career survey, will travel to the Metropolitan in the fall. Still: I’m not sure some of the most important canvases will make the trip. The Louvre has done yeoman work in pulling all this together, it’s very moving. Delacroix who began at a very young age to understand his own gifts and importance was very careful both about his subject matter and his politics. The portraits are intense and specific, the historical scenes grand and documentary, the paintings like Femmes D’Algers clearly outliers in their genre. In the later work, he too is so abstract. And what of the bed sheets he paints, erhaps my favorite image in the whole show. Many do not know you can visit the home of Delacroix in the 6th arrondissment. Go see both. 4. After seeing the many Picassos at the Tate, you would think that would be enough for one week. However, the Guernica exhibit at the Musee Picasso is also worthwhile. The museum highlights the precursors in Picasso’s work, and the effect the painting had on others. It tells of the actual journey the painting took around the world as a symbol of resistance and hope for peace. It has a slide show of Dora Maar’s photographs which she took as the painting took shape at the rue des Grands Augustins. For an entire year I chased Dora, the eternal Weeping Woman, to get a copy of these images (and of course to interview her) for our PBS film. She played cat and mouse with me, first agreeing to see me, then changing her mind at the last minute.Dora had been dumped by Picasso and knew her archive was ever more precious and highly desirable. I think she no longer wanted to contribute to the deification of Picasso. Plus she needed money. The Guernica was Picasso at his best, drawing from multiple sources, but spitting out something entirely revolutionary. When I worked at MoMA and the painting still lived there (now at the Reina Sofia, Madrid, the co organizer of this exhibition), I would often stand in front of it and mourn with the mother holding her child, the horse in agony, the fallen soldier. In a lifetime of Picasso's important works, this painting often holds pride of place. 5.The Fondation Cartier, the erstwhile site of my beloved American Center on the Boul Raspail, home to my modern dance class, Jerry Rubin and Abby Hoffman yippeeing their way across the stage, is now the very elegant see-thru Fondation, at this moment home to an architectural exhibition by Junya Ishigami, Freeing Architecture. A poet/architect who thinks perhaps first in cadence and then in building specifics, has designed excised grottos as restaurant/houses, botanical farms, villas, chapels, cloud gardens, forest kindegartens, home for the elderly, restaurants, museums, universities, and a house of peace. Not all the projects are built. You see he is ‘son of Sanaa’, the echoes of their River project in Connecticut, their museum in Kanazawa, the way they use glass, their long snakelike open air pavillions. Some had me wondering how he was going to heat and cool his constructions and whether in situ they might not appear folly-like instead of practical. If only all clients had unlimited budgets and vision. The Fondation Gardens are looking particularly green and inviting, the pairing of the Jean Nouvel building (one of his less overweaning) and Ishigami a good one. Maguy Marin is doing a project in the building on April 23. If you are in Paris, I would do! 5. The Maison Rouge, a small museum near the Bastille is hosting the first exhibition outside the US of the collection of Deborah Neff’s Black Dolls. Neff has assembled a world class collection of a century’s worth of what we used to call rag dolls made of buttons and thread, stuffed with whatever was handy, dressed meticulously in the outfits of the day. The salient fact that Neff wishes to convey: when asked about which doll they preferred, black children most often went for the white dolls. Black dolls were “bad”. This self loathing however is not present in the dolls themselves who are engaging and modest and who, in artfully arranged groups on simple wooden plinths, stare out at us. Sometimes they feel accusatory and I don't blame them. At least one is crying. 6. The saga of getting a ticket to the sold out Romeo and Juliet by the combined Paris Opera ballet and chorus shall not be repeated here. Suffice to say it was worth it. The very contemporary, ambitious production by German choreographer Sasha Waltz, the rare one when ballet takes precedence over singing---has music by Berlioz. In somber black and white on a severely raked platform, the tragedy unfolds, most effectively in the extended pas de deux. I did not know Waltz’s work which was very repetitive if challenging, but I found the ensemble with chorus dramatic and powerful. 8. There’s always something to see at the Museum of Arts Decoratifs. This time I stopped in for the Margiela/Hermes but was instead captivated by the jewelry by artists show. So many lovely things, my acquisitive nature was in high gear at every vitrine. Here’s the case of another visionary collector, Diane Venet, making me feel small. Still, just to imagine wearing the Ernst Fish or the Tanning Octopus is a treat.